With Art Deco jewelry, modernist designs began to emerge with an emphasis on bold, bright color; straight lines and geometric shapes. 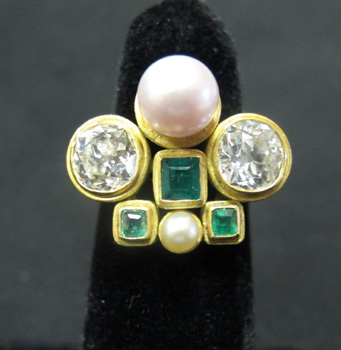 The period after World War I, known as the Jazz Age, gave rise to a new style of jewelry. Pearls and long earrings were popular, along with diamond watches, large brooches, wide cuff bracelets, and long necklaces known as sautoirs which were worn with flapper style dresses without waists. Women cut their long locks and began wearing their hair short with long earrings during the Art Deco period. Art Deco jewelry complemented the playful attitude of the day and was influenced by speed in the form of trains, airplanes, luxury ships, the new sleek automobiles, and the architectonic forms of the first skyscrapers. Egyptian-influenced motifs like the falcon and sphinx were popular due to the discovery of Tutankhamen’s tomb in 1922. 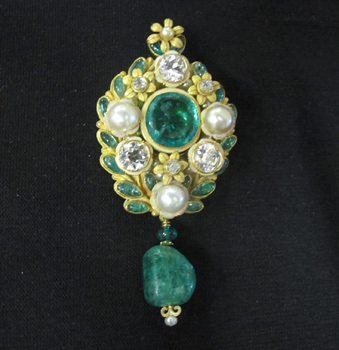 Emeralds, sapphires and rubies became the gems of choice, often contrasted in color with diamonds or black onyx. Synthetic gemstones were often used instead of the more expensive natural gems. Towards the end of the period “all white” jewelry—diamonds and platinum—became popular. The large scale of the jewelry continued. This exhibition would not be possible without the many lenders whose jewelry is on display. Many thanks to the generosity of the individuals who have loaned pieces from their collections. There are examples of both men’s and women’s watches from the Victorian period through the Art Deco period in this exhibition. The evolution from watches worn around the neck to wristwatches for women (known as wristlets) started in the early 20th century. 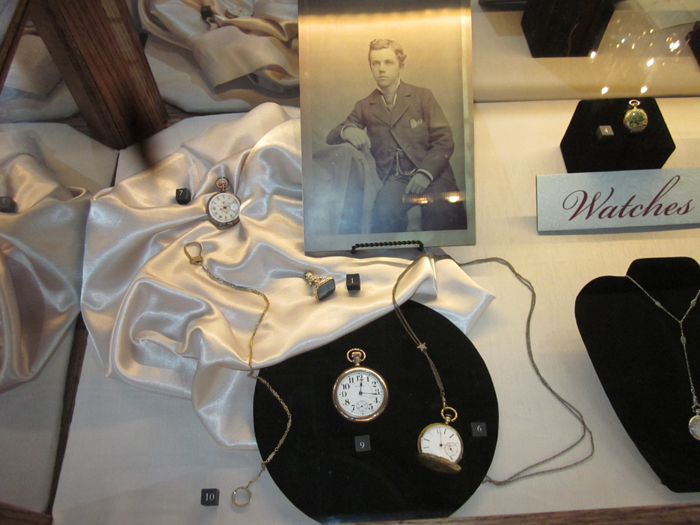 For men, the watch attached to a chain and kept in a pocket was popular until the transition to wristwatches around the 1920s. A lorgnette is a pair of spectacles with a handle. The name is derived from the French lorgner, meaning to take a sidelong look at. The lorgnette was used as a piece of jewelry or an accessory, rather than to enhance vision. These were very popular at masquerade parties and were often used at the opera (becoming the model for today’s opera glasses). They were worn in the later part of the 19th century and the early 20th century. 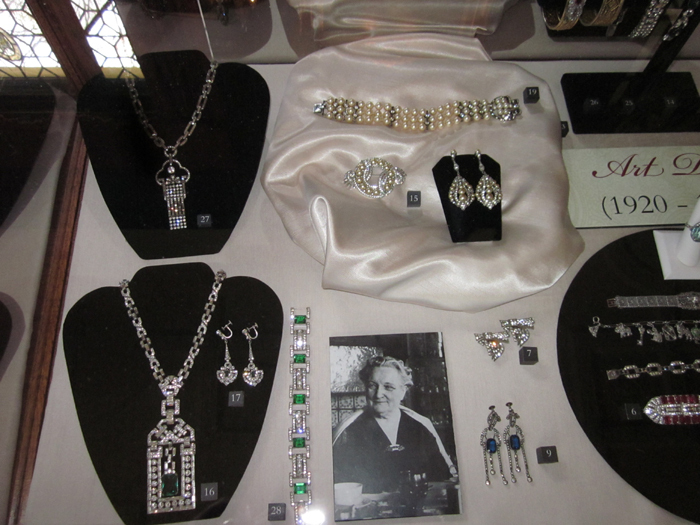 During the years the Seiberling family lived at Stan Hywet, the primary jewelry F.A. 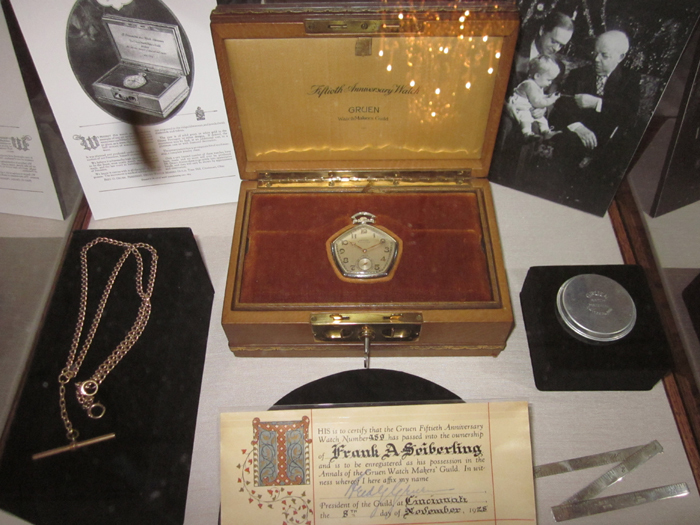 Seiberling might have worn would have been his pocket watch, cufflinks and a dress set for formal wear. He may have worn a wristwatch later in life. The tradition of men wearing wedding bands did not take hold until the mid-20th century. This special watch was given to F.A. Seiberling in 1928 by his sales team at his second company, the Seiberling Rubber Co. The watch was made in a limited edition by the Gruen Watch Company and retailed for $500. When Queen Victoria died in 1901, her son Edward became king for only 9 years. He died of bronchitis followed by a series of heart attacks in 1910. The death of Queen Victoria and the succession of her son Edward marked the end of the Victorian era. While Victoria had shunned society, Edward and his wife Queen Alexandra were the leaders of a fashionable elite that set a style influenced by the art and fashions of Continental Europe. The upper classes embraced leisure sports, which resulted in rapid developments in fashion, as more mobile and flexible clothing styles were needed, such as the split skirt for riding bicycles and horseback riding. During the Edwardian era, women still wore a very tight bodice, but dressed in long skirts instead of only in dresses. This was the last era that women wore corsets in everyday life as a part of mainstream fashion. The beautiful white dresses trimmed with lace of the Edwardian period gave design impetus for jewelry styles that were light, airy and mimicked lace. For the first time, platinum (set with diamonds) became readily available for use in jewelry. Prior to this, the tools had not been developed to properly work with this very hard metal. Other jewelry styles included the garland or festoon-style necklace (clusters of floral design joined by swags) set with pale stones like amethyst and peridot. Pearls were also extremely popular. The dog collar style of necklace worn tight and close to the neck, popularized by Queen Alexandra, is said to have been designed to cover a surgical scar on her neck. In the 19th century, England was a leader in jewelry and fashion—there was little jewelry being made in the United States at this time. The design period is known as Victorian because Queen Victoria was the trendsetter of her era. The early Victorian period is known as “The Romantic Period” when Victoria and her consort Prince Albert played out their love affair for the world to see. Victoria ascended to the throne in 1837 and married her cousin Albert in 1840. During this period there was an interest in Scottish “pebble jewelry” (quartz) as Victoria and Albert had purchased their beloved Balmoral Castle in Scotland. The discovery of gold in America and Australia, the availability of a number of gemstones, and revivals of antique periods in design (which resurged because of important archaeological finds), all contributed to the jewelry styles. Victoria wore a great deal of jewelry, many pieces at once, which were often large and fashioned of gold. English and American women followed the queen’s styles. F.A. and Gertrude Seiberling were married in 1887 during the period that has become known as the Belle Epoque. This period at the end of the 19th century transitioning into the 20th century was a time when many captains of industry amassed considerable wealth. 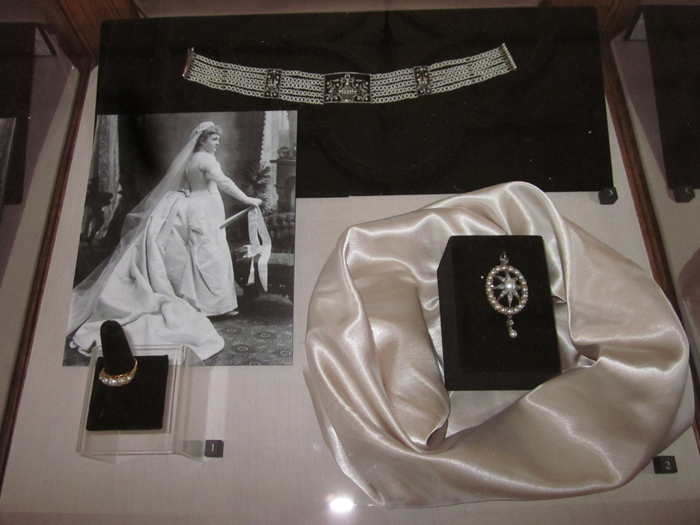 This exhibition displays the types of jewelry that F. A. and Gertrude Seiberling might have worn during the time they lived at Stan Hywet. This includes jewelry that is appropriate in style to the time period as well as the quality that people of their social status and means might have purchased. While none of the Seiberlings’ personal jewelry remains in the Stan Hywet collection, there are clues in photographs and receipts. 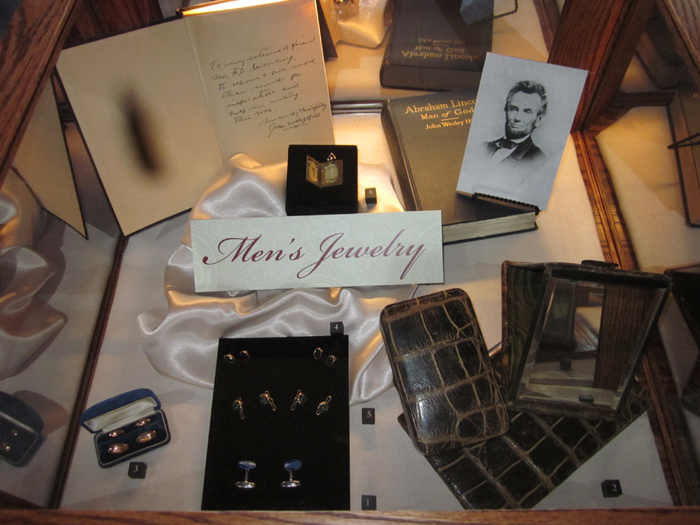 This useful information has been merged with jewelry history for these time periods and takes into consideration the Seiberlings’ interests and lifestyle. 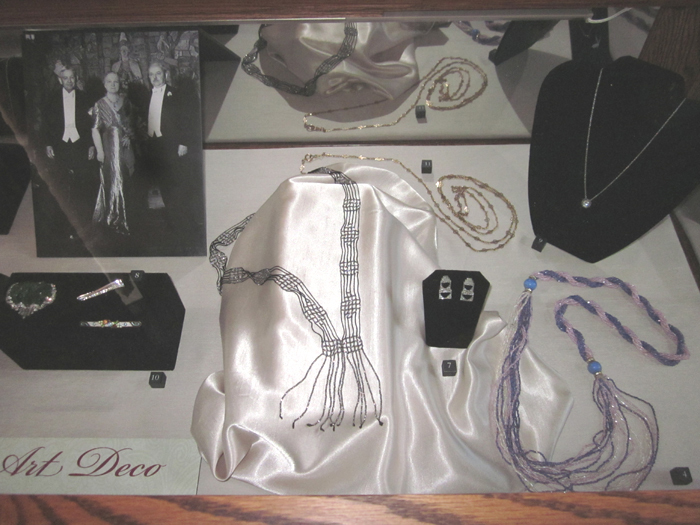 The time the Seiberlings spent in this beautiful home and the taste they exhibited in the design of the house also influenced the choice of the jewelry on display. Included in this exhibition is jewelry from as early as the mid-Victorian period because Gertrude Seiberling would most likely have inherited this style of jewelry from her mother and grandmother. She would also have been old enough to have her own jewelry in the late Victorian design period. Also on display is jewelry in the Edwardian, Arts & Crafts, and Art Nouveau styles that emerged simultaneously at the beginning of the 20th century. The adjacent Art Deco period produced beautiful jewelry with strong visual appeal and Mrs. Seiberling would have owned fine examples. Although she was still living at Stan Hywet as jewelry styles of the 1940s became popular, she was by then an elderly woman. Men’s jewelry that F.A. Seiberling might have worn is also on display. We are pleased to have been lent an important watch that was given by employees of the Seiberling Rubber Co. to Mr. Seiberling. Additionally, costume and accessories that relate to the Seiberlings’ lifestyle may be found throughout Stan Hywet to provide a comprehensive picture of their style and the finer things that were a part of their lives. When Victoria’s beloved Albert died suddenly and tragically in 1861 at the age of 42, the Romantic Period came to an end and Victoria and her subjects began a prolonged period of mourning. Much of the jewelry created during this Mid-Victorian period is made of dark materials such as jet and bog oak. This time period, known as “The Grand Period,” reflected the fact that wealthy Americans and English were taking “the grand tour of Europe” and often brought home jewelry as souvenirs. This included micro mosaic jewels (formed of tiny glass beads known as tesserae) from Italy. Beautifully carved cameos of shell and lava from Pompeii were equally as popular. It was during this time that the Industrial Revolution had really taken hold and jewelry began to be mass marketed. With the discovery of the Comstock Lode in the United States in 1860, silver jewelry became very popular and abundant. Most significantly, diamonds were discovered in South Africa and their accessibility added to their use in jewelry. With the invention of the electric light in 1879, diamonds were increasingly popular for women because the new form of illumination added to their sparkle and allure. Art Nouveau jewelry was primarily made in France, Belgium and to a smaller extent other countries including the United States. As an alternative design movement for an artistically minded audience, it looks very different than the more restrained Arts & Crafts jewelry. Art Nouveau jewelry features curving and sinuous lines, women are depicted in a sort of hybrid, with flowers or insects; and nature is shown in both its beautiful and decaying state. Art Nouveau jewelry is more likely to be constructed of more precious materials than Arts & Crafts jewelry. It relied heavily on the use of a special form of enamel known as plique-a-jour which has no backing and allows the light to pass through it like a small stained glass window. An “anti-establishment” jewelry movement took place in many countries in Europe and the United States which was aimed at an aesthetically minded clientele. Arts & Crafts jewelry was first made in England and then in the United States. It is characterized by being made of materials with less intrinsic value than mainstream jewelry—silver and semi-precious stones vs. gold, platinum and diamonds. Always handmade instead of machine produced, this jewelry from England exhibits amateur qualities and features the heavy use of Limoges type enamel (like a small painting), and designs that often feature almost literal depictions of nature. The American version of Arts & Crafts was more sophisticated and created by more experienced metalsmiths. The last period of the Victorian Era saw the changing role of women. They were beginning to attend universities and demanding the right to vote. Fashions became more streamlined and man-tailored. Jewelry, accordingly, became less significant and smaller. Guest curator, Elyse Zorn Karlin is the founder, publisher and editor-in-chief of Adornment, The Magazine of Jewelry and Related Arts. She is the past president of The American Society of Jewelry Historians and the author of the definitive book on jewelry of the Arts and Crafts Movement, Jewelry and Metalwork in the Arts and Crafts Tradition. She also co-authored Imperishable Beauty: Art Nouveau Jewelry. She is currently the co-director of The Association for the Study of Jewelry & Related Arts, LLC (ASJRA), The Annual Conference on Jewelry & Related Arts and director of American Jewelry Travel. Karlin was a contributing editor to Collector’s, Clocks and Jewelry Magazine, and has written for Heritage Magazine, The Journal of Antiques and Collectibles, Unravel the Gavel, Auction Market Report for Gems and Jewelry, The Rappaport Report and other publications. She lectures frequently and has guest curated Jewelers of the Hudson Valley, The Forbes Galleries, New York City, 2011 and International Art Jewelry: 1895-1925, The Forbes Galleries, 2012.